Undiagnosed or uncontrolled high blood pressure can lead to serious health complications and fatal diseases. The excess force on artery walls due to high blood pressure can damage blood vessels and other organs of the body. High blood pressure can cause hardening of arteries, known as atherosclerosis, which can lead to heart attack and stroke. Consistently increased blood pressure can cause blood vessels to weaken and bulge, making an aneurysm. If an aneurysm breaks, it can lead to life-threatening effects. To continually pump blood against higher pressure in vessels, heart muscle thickens. Eventually the thickened muscle experiences hard time in pumping enough blood to meet the body's requirement for blood, which can lead to heart failure. This can lead to hampering these organs from functioning normally. due to raised blood pressure, the small vessels of eye gets narrowed and sometimes even break, which can result in loss of vision. 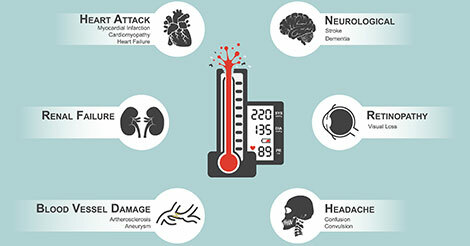 This is a cluster of disorders in body's metabolism, including central obesity, high levels of triglycerides; low HDL, high blood pressure and insulin levels. People with high blood pressure, are more likely to have other components of metabolic syndrome. Uncontrolled hypertension may also affect ability to think, remember/retain & learn. Trouble in memorizing or understanding concepts is commonly seen in people with high blood pressure. Blood pressure is a pretty complicated issue hence it requires special attention. If neglected the blood pressure problem can lead to several other diseases such as heart failure, weakened blood vessels, stroke etc. With the help of a regular whole body checkup by Indus Health Plus, you get a detailed review of your body. You will be able to understand your health needs with this checkup. Contact us through the below query form to discuss your queries.